Ads, good and bad, help fund the open web. But 69 percent of people who installed ad blockers said they were motivated by annoying or intrusive ads. When ads are blocked, publishers don’t make money. We’re already starting to see data trends that can give publishers insights into the most common offending ads. Here’s a look at what we know so far. Pop-up ads are the most common annoying ads found on publisher sites. 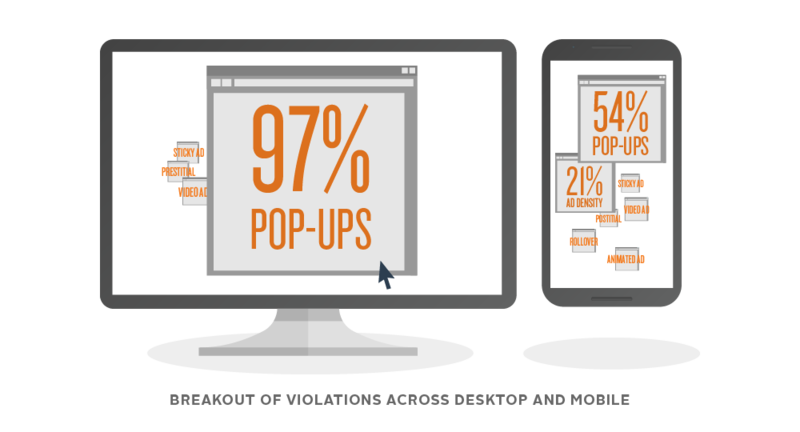 On desktop they account for 97 percent of the violations! These experiences can be bad for business: 50 percent of users surveyed say they would not revisit or recommend a page that had a pop-up ad. On mobile the issues are more varied. Pop-ups account for 54 percent of issues found, while 21 percent of issues are due to high ad density: A mobile page flooded with ads takes longer to load, and this makes it harder for people to find what they’re looking for.